The Circle is a blending of Japanese, Indian and American jazz, along with hints of Latin and yet other flavors. The results are marvelously musical and creative. "Sometimes, when people listen to and talk about my music." Neptune says, "they assume that I think combining different kinds of music is a good thing. But my goal is not to combine all the world's music in a golden melting pot. Instead, I want to make use of certain musical textures and tonality that I hear and like. If it works musically, dramatically, it works." To bring that concept into practice, Neptune "imported" to Japan two highly accomplished Indian musicians -- violinist V.S. Narasimhan and tabla player T. Raja, whom he had worked with in Madras -- as well as guitarist and fellow ethnomusicologist David Harnish from America. 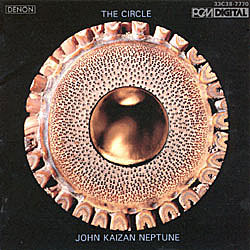 Together with three regular members of the John Kaizan Neptune Quintet, Pianist Kiichi Futamura, bassist Yukihiro Takao, and percussionist Yoshinori Nomi, and others, the "circle" was complete.